Zelina Vega is an professional wrestler, model, actress, and zumba instructor. She is signed to WWE, performing in their developmental territory NXT. She is best known for her work in Total Nonstop Action Wrestling, where she performed under the ring name Rosita. She has also worked for various independent promotions as well. While in TNA, she became a one-time Knockouts Tag Team Champion with Sarita. Ever get the opportunity to meet Zelina Vega? Ever gotten a chance to have a photo taken with her or of her and want everyone to see what you experienced? 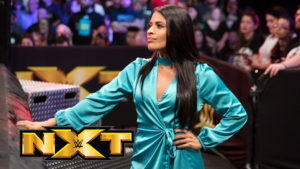 Then you’ve come to the right place Zelina-Vega.Net, would like to see all your photos featuring the Zelina Vega and to display them for everyone to enjoy. Any photo donations for our photo gallery can be sent to zelinaveganet@gmail.com. Thank you. Joe forces Ali into the corner. Joe misses a spinning back elbow. Ali lands a few strikes. Ali hits the ropes and gets run over by Joe. Joe pounds on Ali in the corner. Ali lands an enziguri. Ali tags in Mysterio. Joe tags in Almas. Mysterio takes Almas over with a head scissors. Spinning back elbow by Almas. Ali tags in and drops Almas with a slingshot x-factor. Joe tags himself in. Ali catches Almas with a second rope tornado DDT. Ali sends Almas over the top rope. Ali tries a dive but Joe catches him and launches Ali into the announce table. After the break, Ali finally makes the tag to Mysterio. Mysterio takes Almas over with a springboard ranna. Mysterio blast Joe with a springboard senton. Mysterio catches Almas with a Canadian Destroyer… yes, you read that correctly. Ali takes out Joe as Mysterio tries to hit the 619 on Almas but Almas reverses it into the HammerLock DDT for the win!